One of the nice things about reviewing is that you get to check out things you might not otherwise have the chance to hear. And of course what seems worthwhile I pass along to you, the reader. 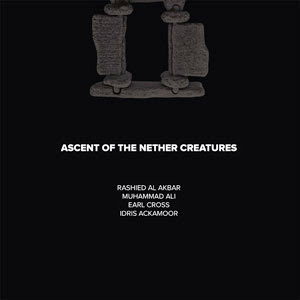 Such a rather obscure but nice album is the 1980 Netherlands club date of the quartet of Earl Cross, trumpet, Idris Ackamoor, alto and tenor, Rashied al Akbar on bass, and Muhammad Ali, drums. They gather together their collective forces for a very fire-y freebop set on Ascent of the Nether Creatures (No Busines LP 78). It is one of those limited edition vinyl releases that No Business does so well, and it is a good one. The sound is not entirely perfect yet very clear. The music makes up for what is very slightly less than pristine sound. Cross and Ackamoor make excellent front-line soloists and have it all together on this set. Akbar is doing good things on bass. And as might be expected of Muhammad Ali (late brother of Rashied Ali), the drumming is expansive and very swinging. They do four originals that have contrast and plenty of room for free blowing. And they come through. These are players that have not gotten near enough credit for their contributions to new thing freedom. A careful listen to this record tells you why that should not be the case. It captures a period when free jazz was still new enough that the thrill and even ecstasy of letting it all go to the rafters was still there. There is no reason why that should not still be the case but there seems less of it now. Listen to this one and recapture some of that thrill!